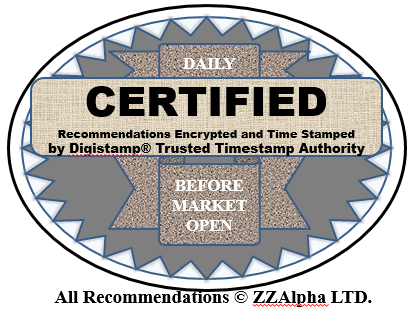 ZZAlpha LTD. provides transparency, careful evaluation of risk, consistent methodology, and special expertise. We do not buy or sell stocks to investors. We receive no compensation from anyone based on which stock we recommend. We handle no client funds. Our sole business is delivering our daily recommendation portfolios to subscribers. We provide five year, one year and YTD track record of the recommendation portfolios every day. 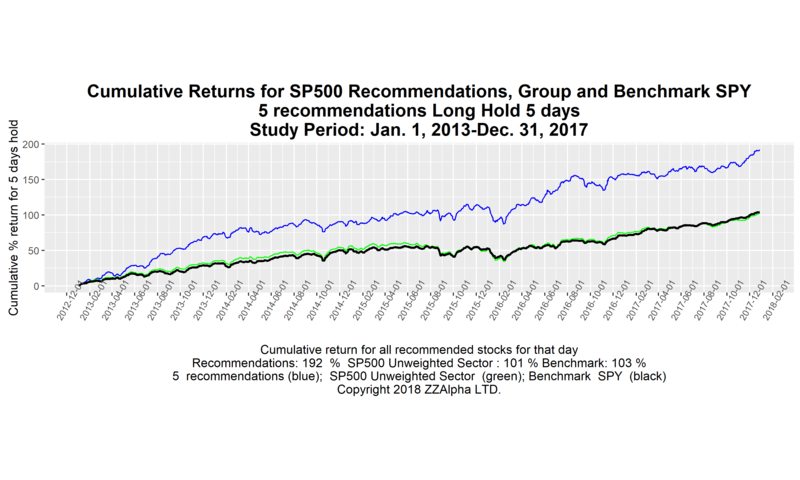 All recommendations - collected into a single compilation - are certified by a trusted third-party and archived daily before market open to support stringent auditability. This certified compilation of all newsletter recommendations is available to clients for audit after the recommendations expire. We prepare detailed, understandable risk profiles for every portfolio. We evaluate risk in simple, conservative terms: what was the portfolio’s worst drawdown, what is the win-loss ratio, how does it compare to benchmarks. We do not consider upside volatility a risk because investors benefit from upside movement. Because we recommend only liquid, US exchange traded stocks, every portfolio can be accurately valued at anytime without guesses. Because we supply specific buy lists with a recommended sell horizon, we can accurately profile historic risk of each portfolio. Our statements of historic returns do not involve leverage, options or derivatives. We anticipate that unexpected and extreme events will occur. As the event occurs, our machine learning technique learns how the market is changing, and how to respond successfully. To be clear: almost every recommendation portfolio has underperformed its benchmark in some year. Every portfolio has risk. Please review the example Performance and Risk Profiles. Our recommendations come solely from the objective ZZAlpha® machine learning technique. Only publicly available fundamental, end-of-day and SEC data are inputs. Recommendations to subscribers never deviate from the systematic recommendations from the computerized machine learning technique. We embrace the effectiveness of the scientific method. We ignore all tips, human analysis, subjective opinions and forecasts. Our machine learning technique assumes that truth in the market constantly changes and must be re-learned. Unlike traditional statistical and parametric models, it does not assume that static, fundamental truths exist in the market. That is why it adapted automatically to the 2008 crash and 2009 boom. That is why it does not make long-term recommendations. We logged over 100,000 hours of computer time testing and analyzing the performance and the risk of the machine learning technique in varied situations. Its track record is remarkable. It produces robust results across over 40 market segments, and throughout a 10 year study period (including 5 years of certified recommendations). The statistical significance of returns in several market segments exceeds 3 standard deviations above the expected. We applied rigorous evaluation of every recommendation portfolio and thousands of scientific Monte Carlo simulations to establish the significance. The ZZAlpha machine learning technique originates with our founder and Chief Scientist. He developed advanced analytics, machine learning, and high-performance computing methods for critical activities of the US Intelligence Community for ten years before founding ZZAlpha. He was trusted at the highest security levels. At age 52, he earned a Masters in computer science and artificial intelligence with a 4.0 gpa. He has over 100 publications, and as senior analytics scientist for an international data warehouse company he consulted with major financial, communications, and manufacturing firms on analysis of big data. In his 22 year prior career, he was a commercial and antitrust trial and appellate attorney in Texas and Colorado. He handled securities cases for brokers, financial advisors and professional investors. He is a member of the Bar of the United States Supreme Court. He has been an active investor for 25 years. He is past-president of the Tampa-St. Petersburg Chapter of American Association of Individual Investors. He relies on ZZAlpha recommendations for his own investments. He constantly probes to improve the usefulness of ZZAlpha recommendation portfolios for professional investors.